One of the most convenient ways to park at Birmingham airport, ACE Meet and Greet is a firm favourite with our customers time after time. All you need to do is drop your car off with one of the uniformed chauffeurs situated outside departures and our fully-insured drivers will do the rest for you. On your return, simply pick your car up from where you left it - it really couldn't be any easier. Even though our flight was 30 minutes early our car was there waiting for us. Thank you. Overall not too bad, but there are few areas need improving. On return there are no sign visible to direct you towards Valet parking area, which is nearly 10 minutes walk (not easy with luggage etc. ), only sign visible when you actually arrive at the car park. Staff were polite, courteous and helpful. I was not very impressed. I had to wait 20 minutes for someone from Mapel parking to arrive at the car park to meet me, despite ringing 20 minutes before I arrived as requested. My car wasnâ€t at the car park when I arrived back from my trip either. I was disappointed in the service. 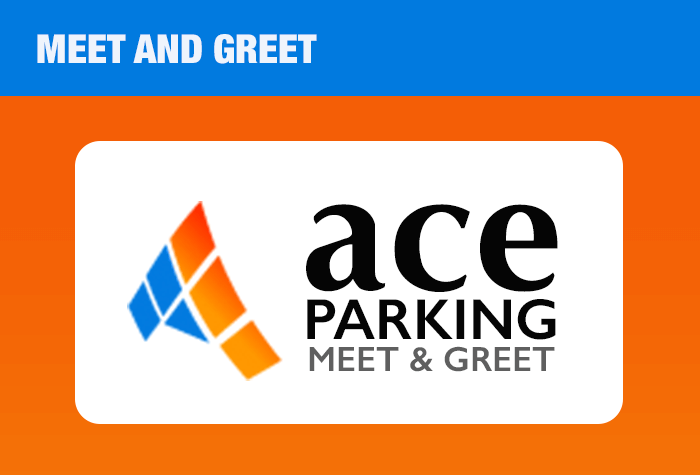 Our customers rated ACE Meet And Greet on average 8/10 (320 reviews). Read ACE Meet And Greet reviews. Give ACE a call when youre about 20 minutes away from reaching the airport, and when you arrive head to the Valet Parking car park, collecting a ticket from the barrier. Your driver will be carrying ID and waiting to meet you there. Hand them your keys and head into the terminal while your car is parked for you in a secured car park. From there, it's a short walk to check-in. When you return walk back to the Valet Parking car park where your driver will be waiting to return your car to you. Youll also be given a ticket allowing you to exit the car park without paying. - The airport's drop-off point cannot fit vehicles higher than 7 feet, minibuses, high-sided vehicles, mobile homes, lorries, caravans or trailers. - ACE can only take cars that fit into a standard size parking space, which is 2.4m x 4.8m. You'll be charged extra if your car is too large. Minibuses and vehicles with 8 or more seats can't be taken for Meet and Greet services and will cost extra for other packages. To see if ACE can take your vehicle, call us on 0800 093 5478. - Please be aware that due to time restrictions in the car park you must be at the collection point within 10 minutes of your call, or you may incur additional charges payable at the exit barrier. Make sure you let ACE know when youre about 20 minutes away from the airport. When you reach the terminal head for the car park signposted Valet Parking outside Departures. Take a ticket from the barrier and turn right to park in a space by the railings. Your driver will be carrying ID and waiting to meet you there. Simply hand over your keys and your car will be parked for you while you head into the terminal. After youve reclaimed your luggage and passed into arrivals, simply head back to the Valet Parking car park and meet the driver there. Theyll give you a ticket allowing you to exit the car park without paying, and then youre on your way home.